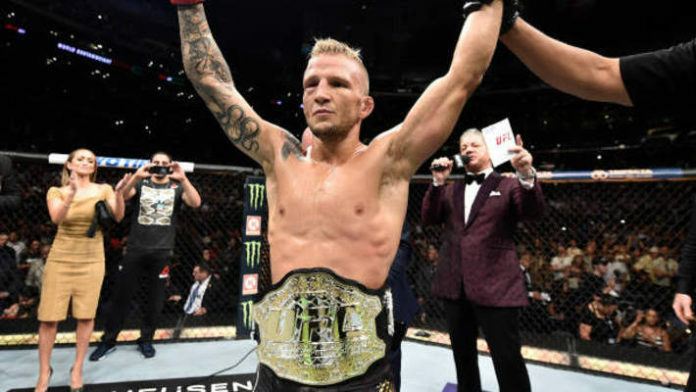 The MMA world was given shocking news on Wednesday morning when UFC bantamweight champion TJ Dillashaw revealed on his Instagram that he was giving up his belt due to failing a drug test. According to Dillashaw’s post, the long-time bantamweight champ was flagged by USADA and the New York State Athletic Commission for “adverse findings” in his post-fight drug test following his UFC Fight Night 143 TKO loss to Henry Cejudo on January 19. He’s been suspended for one year retroactive to the date of the bout, and to save himself the embarrassment of being stripped of his belt by the UFC, he decided to give it up instead. The UFC bantamweight title is now vacant. The UFC has yet to officially comment on the situation — I’m sure UFC president Dana White will come out and say something today — but it seems reasonable to conclude the UFC will set up the next bantamweight title fight for an upcoming card later this spring or summer. It’s more than likely that one of the fighters competing for the belt will be top-ranked contender Marlon Moraes, who is coming off of a brilliant finish over Raphael Assuncao that pretty much cemented his place as the next contender. The UFC was planning on having a rematch between Dillashaw and Cejudo with Moraes getting the winner of that fight, but now that Dillashaw is out of the title picture for the next year, that gives Moraes the right to fight for the belt. The UFC could match him up with Cejudo if they want to, but if I were the matchmakers, I would give Moraes a shot at the vacant title against Pedro Munhoz, who is coming off a brilliant KO win over Cody Garbrandt. If that’s the case, then it would leave Cejudo as the flyweight champ and ready to defend his belt against the top contender at 125lbs, which is currently Joseph Benavidez. Cejudo and Benavidez fought a few years back with Benavidez winning a narrow split decision, so a rematch would make a lot of sense. If not Benavidez, then the winner of this weekend’s Deiveson Figueiredo and Jussier Formiga bout could get a shot at Cejudo’s belt. Either way, with Dillashaw out of the picture now, there’s no reason for the UFC to have Cejudo move up a weight class. It makes way more sense now for him to stay at flyweight and defend his title there, leaving the bantamweight contenders that are actually winning fights at 135lbs the right to fight for that belt. So as disappointing as it is to see Dillashaw test positive and vacate his belt, maybe it’s a blessing in disguise for this to happen. Instead of having the bantamweight contenders on a backlog, now Moraes can get his title fight, leaving other contenders like Munhoz, Aljamain Sterling and Petr Yan not far away from getting a crack at the belt themselves. It also means that the flyweights actually have something tangible to fight for now, as there’s no need for the UFC to get rid of the division. UFC president Dana White was always unclear about the UFC’s plans for the flyweights, but for now this news of Dillashaw vacating his belt leaves the flyweight division up for grabs, too. It just makes way more sense to have two divisions and two belts than to eliminate a whole weight class and the title fight that goes along with it. As sad and as disappointing as it is to see Dillashaw give up his belt and possibly tarnish his legacy, perhaps this was actually the best thing that could have ever happened to both 125 and 135. Only time will tell if that’s truly the case.